This book has been sitting on my kindle for a few years now, after trying to start it on a couple of occasions to no avail (mostly because I ended up getting distracted by different readings for school). But I finally got around to it! Whilst also in the midst of the tv adaptation. Which, I have to say, I am absolutely loving: it definitely expands on the world presented in the book, allowing different characters to be more developed, stick around for bigger parts of the story (rather than being a small blip as some are in the book), and also allow us to see a lot more of the larger story at play that is definitely present in the novel, just more on a sub-level that we do not directly see or get to interact with as readers. In particular, I found the character of Laura Moon to be a bit lacking or not fully developed in the book, but she is being given a lot more breathing and growing room in the show which is absolutely fantastic! But that’s not what this review is about, so let’s chop to it. 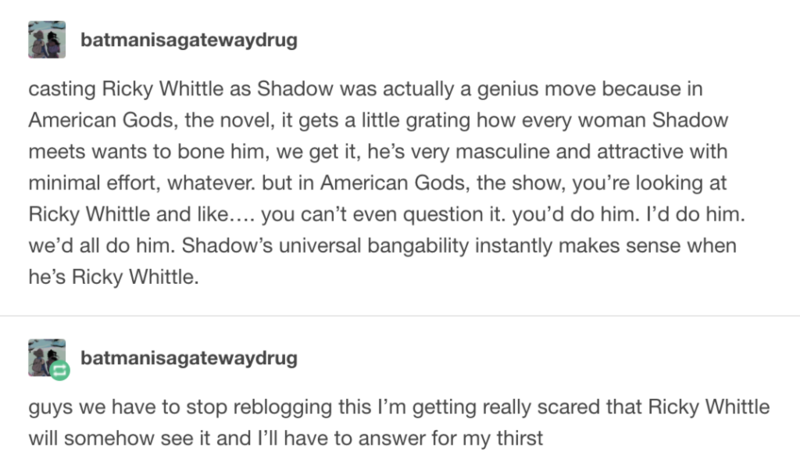 American Gods is the story of a man who goes by Shadow Moon, as he is sucked into working for a man called Mr. Wednesday, who is… well, a God. But an old one who along with many of the other “old Gods” in America are having a difficult time in the present day (some of their iterations in other parts of the world, however, are doing just fine), as less and less people remember and praise them, thus resulting in a loss of power. “New Gods”, however, are starting to crop up, in the form of things that modern-day people spend so much time and energy on: technology, media, etc etc. And so, what does this call for? A war between the old Gods and the new, of course! While the overall story follows Shadow on his (very confusing) journey with Wednesday, we also get little episodes here and there with other Gods and characters, which are very interesting, and very much lend to an overall feeling of this book being about the immigrant experience, both for the Gods as well as for some different characters highlighted in the “Coming to America” chapters. These little episodes also make the book almost feel like a comic book at times, and I often found that I wanted more from these side characters that only show up for one tiny little chapter only to disappear. Some of them definitely tie in with the rest of the story or give us another look at some of the Gods during their lives in America, but I would have loved to have seen more of a connection with some of them. I am a big fan of mythology, so I really enjoyed this book and coming in contact with different Gods, some of which I recognized and others that I didn’t. It made me want to look more into some of these new “old Gods” that were being represented by the book! Some of them, however, I just couldn’t figure out who or what they were trying to be manifestations of! I’m sure with a little digging I could figure it out, though. All that being said, I do have to nitpick a little. It’s just minor things that stopped me from absolutely loving the novel. One is that I expected more from the battle or fight between the old and new Gods. Sure, there is some fighting and damage, but when you spend the entirety of a book building up to one particular event, you’d expect it to be more central, I guess? (I realize that this was also the issue I had with Good Omens… huh). The outcome and action surrounding is quite exciting and interesting, but I still just felt like something was lacking in the final 3rd or so of the novel. The second thing I would nitpick is that every now and then there would be some statement made by either a character or just narration that would make me roll my eyes, purely because of it’s crassness or seeming attempt to be vulgar and shocking, but just felt not entirely natural? It’s like, I get it, you’re edgy, now was that necessary? Like I said, though, this is nitpicking. 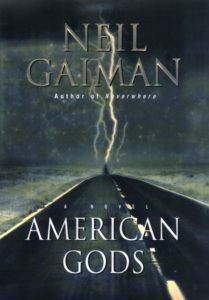 I am glad I finally got to reading American Gods, because it was a great book; both imaginative and entertaining. I definitely feel, however, that it’s one of those things that I should read again some time in the future, now that I know how everything plays out, because I know that there are some things that went right over my head or foreshadowing that I wouldn’t have noticed in this first run through. Because of that, I also don’t think it’s one of those books that you can only enjoy reading the first time around: I definitely feel like it would be one that a lot of people would enjoy reading multiple times. So we shall see how I find it on another go around, some time in the future! Share the post "“I Can Believe Things Where Nobody Knows If They’re True Or Not”"
I’ve been watching the TV show (I got sucked in because so many great actors!) and I keep seeing copies of the book thinking, maybe I should? But it’s such a brick! Maybe I’ll grab it next time I’m at the book store. It sounds from your review like it might be worth the investment. That’s part of the reason it took me so long to get into it, it’s quite a long book! But it really didn’t take as long to read as I thought, because I never really found it dragging at any point. Reading co-currently with the show has definitely been interesting to try and figure out how they are re-working all the plot points, etc.